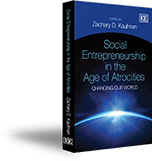 Social Entrepreneurship in the Age of Atrocities is available in hardback, paperback, and as an electronic book. Please note that all profits from book sales are donated to charity. Publisher (Edward Elgar Publishing) – If you order through the publisher, you will receive a 20% discount on the paperback version and a 10% discount on the hardback version.